Getting hitched doesn’t have to mean emptying your bank account. One easy way to save money on wedding expenses is by making your own table centerpieces. The following roundup of ideas features frugal DIY projects for every type of reception. Mason jars continue to be one of the more popular wedding decor trends. 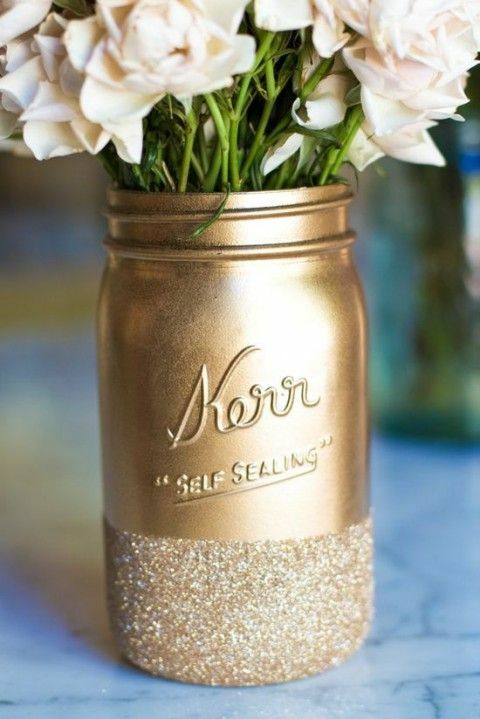 Instead of using plain jars, update yours with spray paint and glitter. Idea courtesy of Happy Wedd. 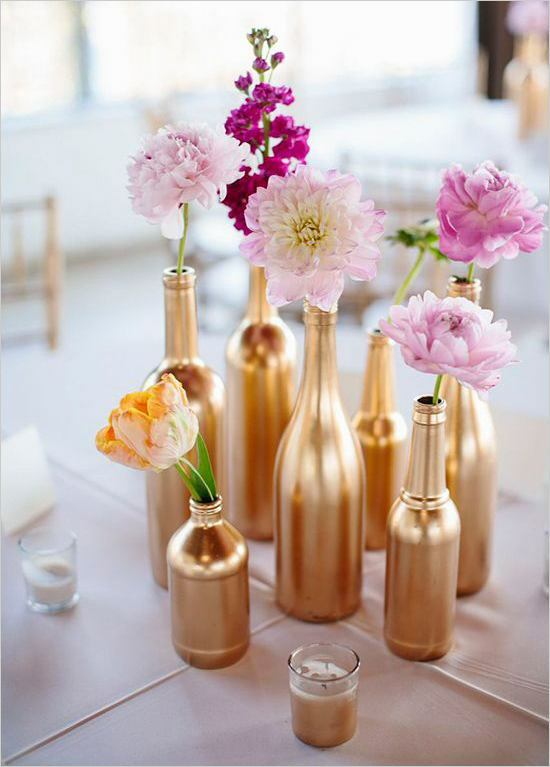 Pull some wine, beer, soda, and juice bottles from your recycle bin, then spray paint them gold. 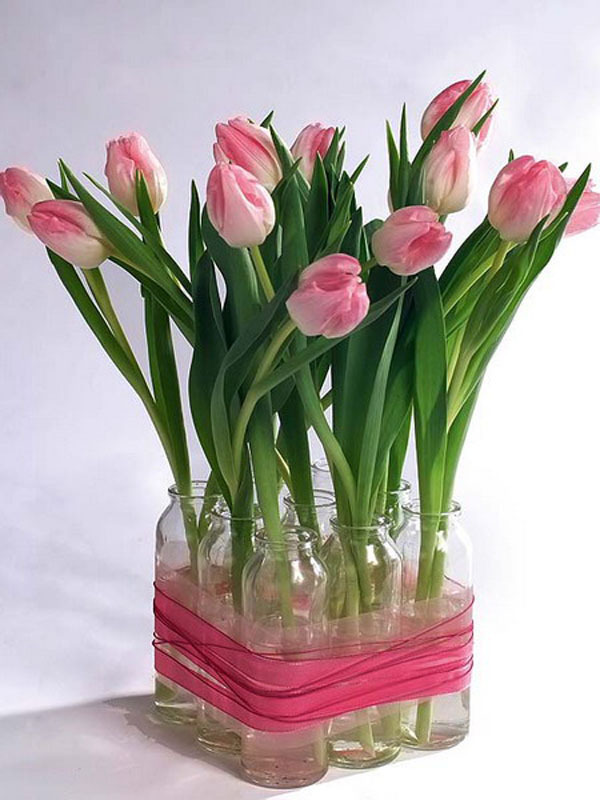 Arrange them with a single bloom in each bottle, scattering heights for visual interest. Learn more at Wedding Chicks. Tie together nine small glass bottles with thick ribbon in your wedding colors, then add a bloom to each bottle for an inexpensive centerpiece with a lot of visual impact. Photo courtesy of Furnish Burnish. Paper lanterns have long been recognized as a staple of budget-friendly party decor, but I’m willing to bet you’ve never considered using them as oversized vases. 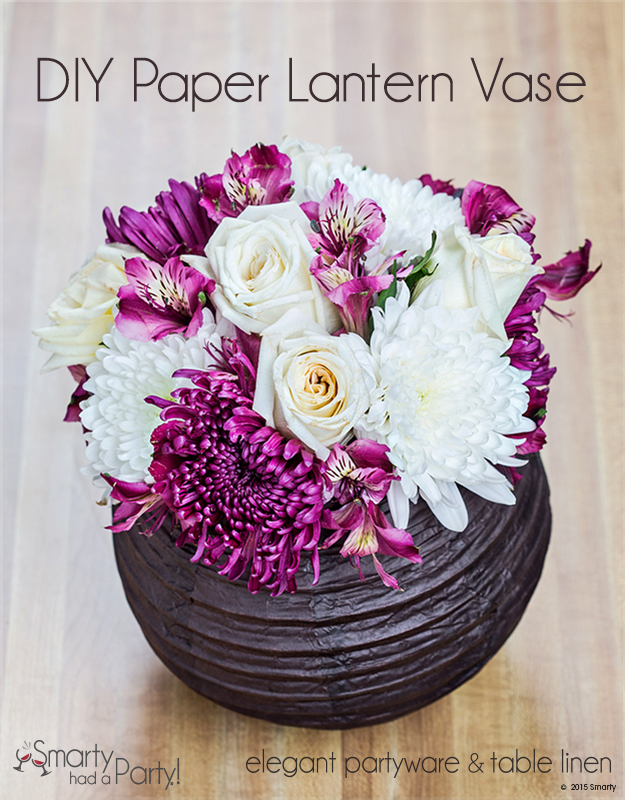 Learn more about this unique wedding centerpiece idea at Smarty Had a Party. 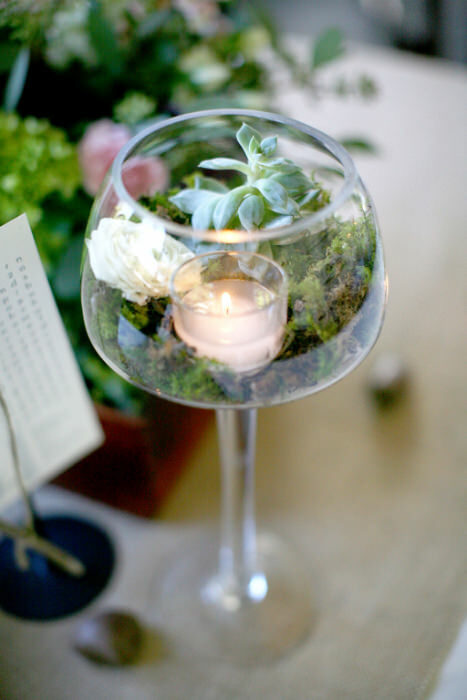 A miniature terrarium created inside a wine glass is an unusual and sophisticated choice for your wedding. See more simple centerpieces at Intimate Weddings. Filling clear vases with fruit is an easy and affordable way to create wedding centerpieces. 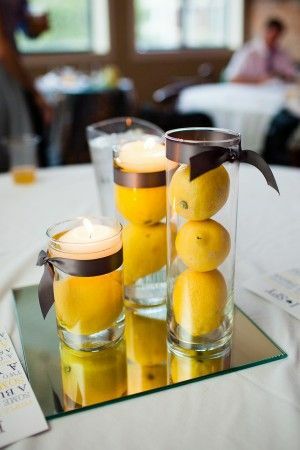 Lemons work particularly well for this project, since yellow and gray remain very popular choices for wedding colors. Photo courtesy of Society Bride. 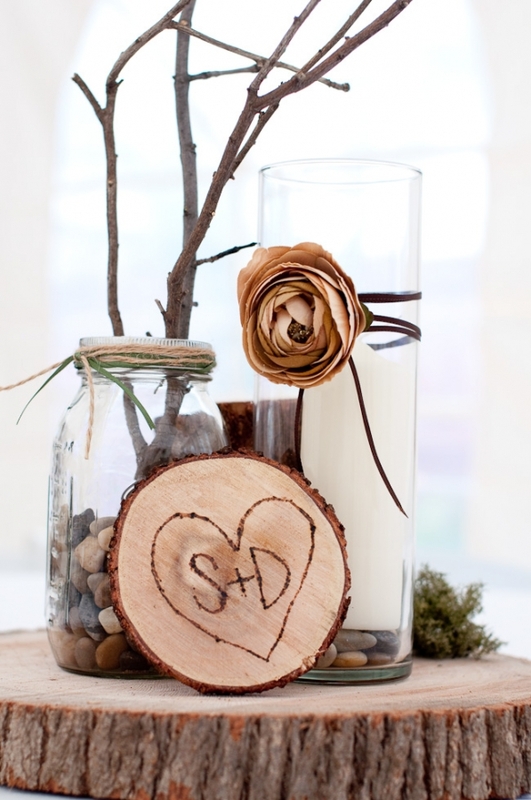 Outdoorsy couples looking to incorporate their love of nature into their celebration will appreciate this DIY centerpiece made from wood slices, river rocks, tree branches, candles, and a mason jar. Learn more at The Wedding Specialists. 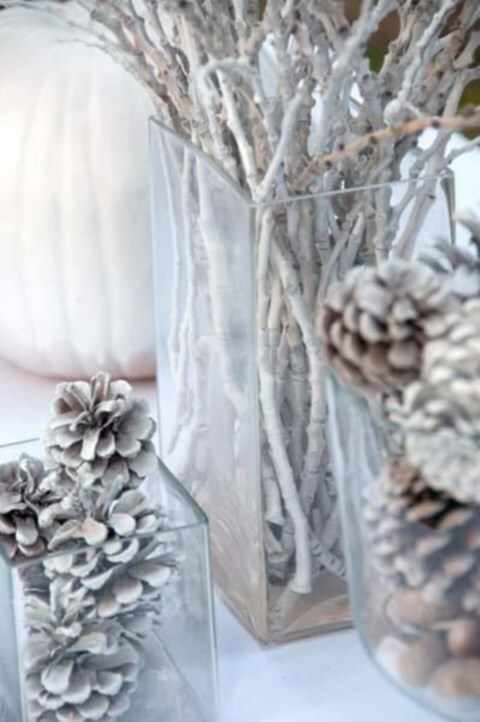 For a winter wedding, tree branches and pine cones artfully arranged in clear vases make for an eye-catching centerpiece. Happy Wedd has more winter wedding decor ideas for you to use as inspiration. Fill large cylinder vases with river rocks, then add water and floating candles. 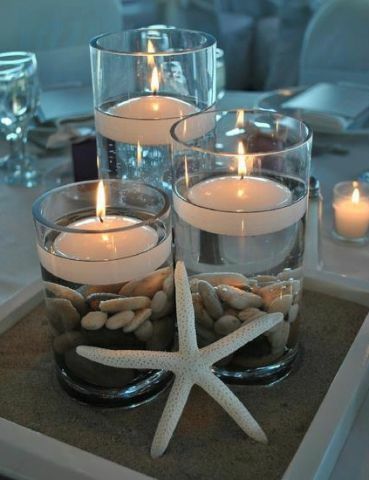 Arrange the vases together on a sand filled tray and top it off with a starfish. Photo via Pinterest. 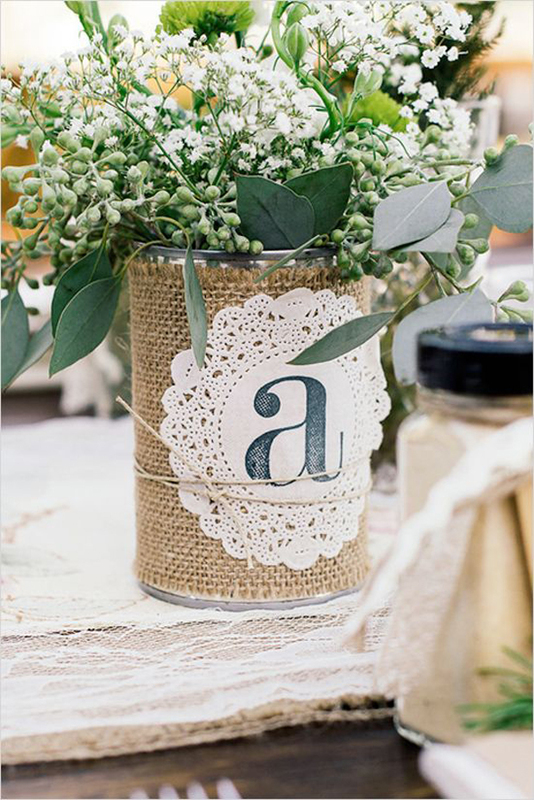 Tin cans make the ultimate frugal centerpiece for a rustic wedding when they’re wrapped in burlap and filled with baby’s breath. Visit Want that Wedding for a wide assortment of DIY tin can wedding ideas. 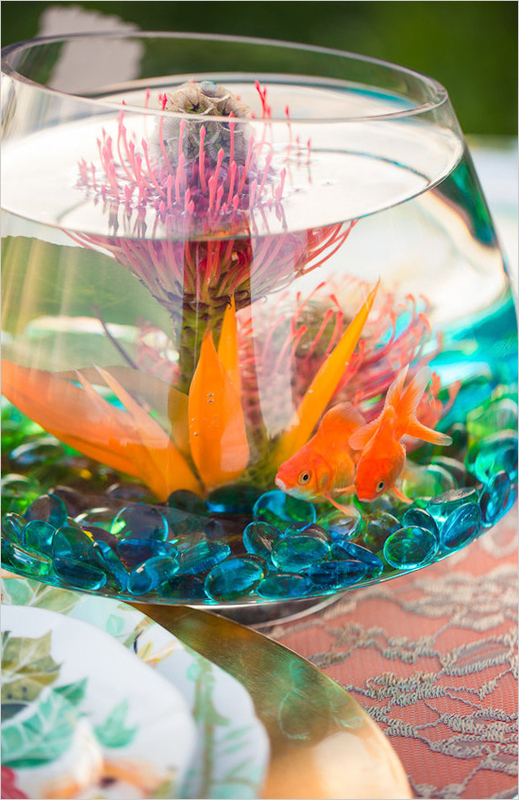 For a relaxed vibe, skip the flowers all together and have fish bowls at your wedding. Head over to Wedding Chicks for more colorful Bohemian wedding ideas. 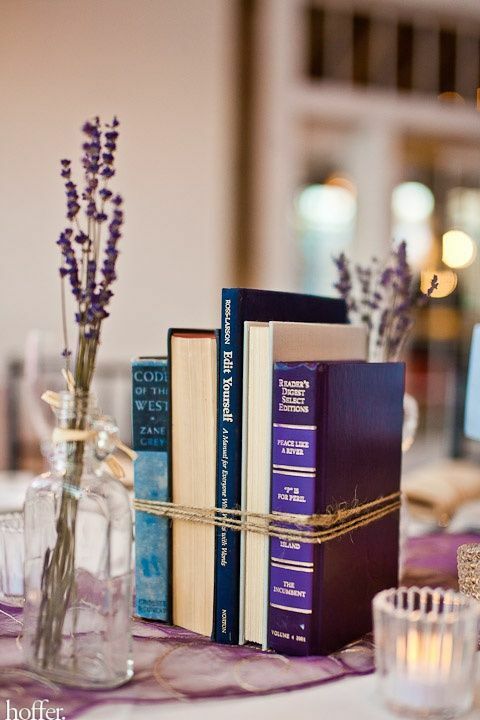 If you’re an avid reader, put some of your favorite titles to good use by stacking them together to create literary themed wedding centerpieces. Yes Missy has several ideas to choose from. 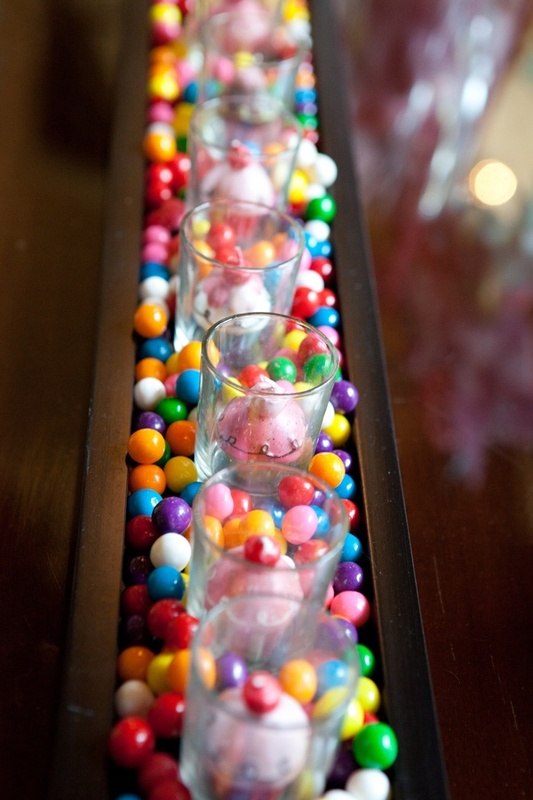 Candles are a popular DIY centerpiece, but this version incorporates gumballs for a whimsical touch. If you decide to go this route, however, keep in mind that any children present at your wedding will mostly likely have their hands in the centerpiece all night long. Idea courtesy of One Stop Party Ideas. If you’re an avid scrapbooker, you probably already have stacks of gorgeous patterned papers at your disposal. 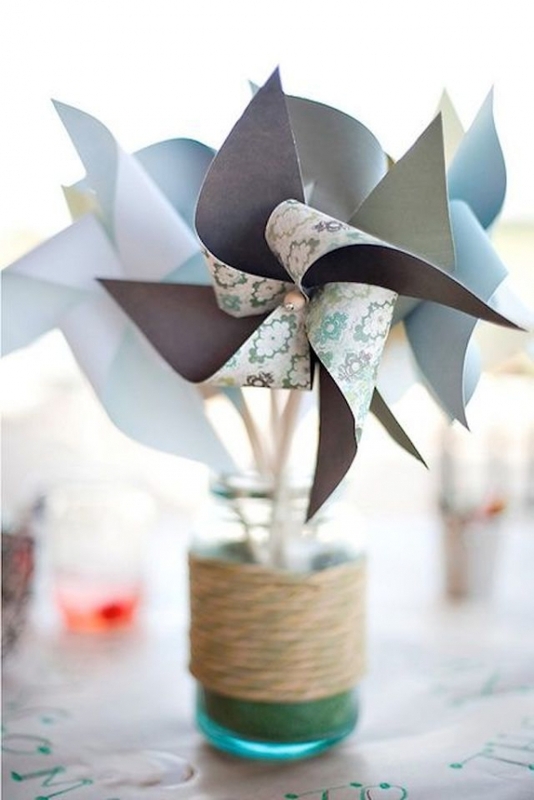 Make some cute paper pinwheels and display them in a twine wrapped mason jar for a playful centerpiece your guests will love. Hitched Salon has the details.